The best relationships between the arts, business and donors have been recognised at the 2010 National AbaF Awards, with the partnership between property developer The GPT Group and creative urban renewal project Renew Newcastle taking home the top award. 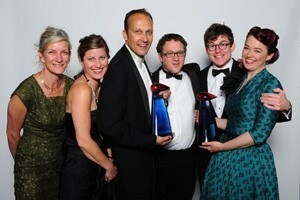 The partnership between The GPT Group and Renew Newcastle, a Not for Profit organisation that connects artists and creative groups with vacant and unused buildings, won the Partnership of the Year Award at the 2010 AbaF Awards. Renew Newcastle was founded in 2008 to enable vacant buildings in Newcastle to be used for creative and artistic purposes. Property developers the GPT Group came on board as the first partner. Together they also won the Toyota Community Award. (L-R): Petra Hilsen, Renew Newcastle; Amanda Pieriboni, The GPT Group; David Sleet, The GPT Group; Marcus Westbury, Renew Newcastle; Roderick Smith, Renew Newcastle; and Marnie Jackson, Renew Newcastle. against high profile companies, fantastic arts organisation and partnerships involving large amounts of money. He says he was shocked their partnership – which has been done very much on the cheap by providing spaces for more than 60 groups of artists, brought life back to a once dead Hunter Street Mall and reactivated dozens of once empty buildings – could even be in the running. David Sleet, GPT Development Manager, says the partnership has delivered real benefit to the community of Newcastle as the process of CBD revitalisation continues. He says the initiative works on all levels – culturally, socially, financially and environmentally. Westbury says GPT are exemplary property owners in the city – they have not let their property’s sit empty and become derelict and instead have used them to incubate new creative enterprises. 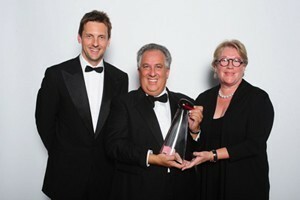 The Dame Elisabeth Murdoch Arts Business Leadership Award was won by Edmund Capon AM OBE. Capon is the director and chief curator of the Art Gallery of New South Wales since 1978, and under his leadership the gallery has become a vibrant world-class museum. The Goldman Sachs Philanthropy Leadership Award was won by Simon and Catriona Mordant, who have been active arts philanthropists for more than 20 years. The Richard Pratt Business Arts Leadership Award was won by Rick Allert AO, a founding board member and a founding councillor of AbaF in 2000. This decade-long partnership has culminated in the 2009 announcement of a five-year agreement worth $1.5 million, the gallery’s largest ever corporate sponsorship. The Sixth Asia Pacific Triennial of Contemporary Art drew more than half a million visitors. Both partners are keen to engage more with the Asia-Pacific region, making this partnership a perfect alignment of energy and interests. Green Team Australia and Envelope Group applied their expertise in marketing, branding and community engagement to raise the profile of the national choral event, the Festival of Voices. In 2009 the rebranded festival increased registrations by 62 per cent, and returned almost $1 million to the Tasmanian economy over four days. The South East Arts Region connected a professional photographer and film-maker with a group of parenting teenagers in Cooma and produced a short film about their lives focussing on positive health messages. Frasers Property and Queen Street Studios have activated a space in Chippendale which would otherwise lie empty. Frasers also provides financial support to run the space. The partnership provides free studio space and residencies for visual and performing artists. It is a popular venue for events and has quickly become a lively centre for independent arts practice. For seven years, FORM and MHP Billiton Iron Ore have delivered creative community development throughout the remote Pilbara region. The projects improve quality of life for Indigenous and non-Indigenous Australians, through new infrastructure, community arts activities, business and professional development. Projects are long term and will continue for the foreseeable future. Polyglot Theatre established a donations program in 2009 in response to a funding cut. In one year, donations leapt from 0.1 per cent of turnover to almost 10 per cent, helping the company to post the largest surplus in its history. The leap in donations enables the company to grow with confidence. The Substation in Newport, in Melbourne’s west was derelict when glazier Darren Williams decided to do something about it. With a dream of creating a community arts centre, Williams applied his glazing, construction and project management skills to a lengthy restoration project. His years of voluntary leadership have paid off, with the Substation converted into a community asset that is home to many arts and cultural activities. RAC’s major partnership with Black Swan supports the Hotbed Ensemble, made up of young and recently graduated actors, designers and stage managers. The partnership pays the wages of the ensemble, which attracts young, urban audiences and is a vital part of Perth’s theatre calendar. RAC became principal sponsor in 2008, ensuring that the ensemble could continue, retaining the talents of these young theatre makers in Western Australia. The Glover Prize is Australia’s richest annual landscape art prize, awarded for the best new painting of the Tasmanian landscape. Federal’s cash and in-kind support underwrites the prize, an exhibition, a dinner, concert and associated events in Evandale. Federal exhibits the winning paintings in its hotels and links its brand with a high-quality cultural event. Windmill Theatre and SA Water joined forces to create quality live theatre that promotes water-wise messages to a young audience. The partnership helps SA Water reach young people and families, while Windmill receives support to increase its audiences and create new productions. The Awards were presented by Senator Kate Lundy, representing the Minister for the Arts, at Randwick Racecourse in Sydney.